The FlowForma Compliance Features extend the FlowForma® Process Automation tool with additional functionality to enable advanced auditing, helping you comply with ease. The Compliance Features, when combined with FlowForma's Forms and Workflow, enable organizations within regulated industries to design and build processes that can be fully certified to meet regulatory requirements on electronic records for e.g. ISO 9001 and 21 CFR Part 11. The features work to enhance the audit abilities of the FlowForma Process Automation tool, capturing additional data and providing audit histories that are easily examined by auditors. Have FlowForma Process Automation Already? If you’re already a FlowForma customer, you can add the Compliance Features with the click of a button, instantly maximizing your existing processes with additional functionality. The Compliance Features comprise of three specific areas; e-Signatures, an integrated form audit record and a flow snapshot (a document describing the flow definition). Together, these features provide all the functionality required to validate FlowForma processes to 21 CFR Part 11 compliance. The same features can be used in many other industries, where regulatory compliance is required on the storage of electronic records. 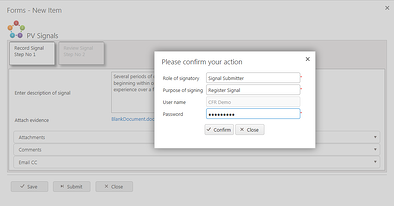 The Compliance Features enable e-Signatures on step submissions. The default signature is designed for 21 CFR Part 11 compliance and prompts for role of signatory and purpose for signing as well as the password of the current user. Alternatively, where Code of Federal Regulation (CRF) compliance is not required, a standard e-Signature is an option which simply requests a password. The Flow Snapshot allows the user to generate a document describing the content of the Flow Definition (the process template). 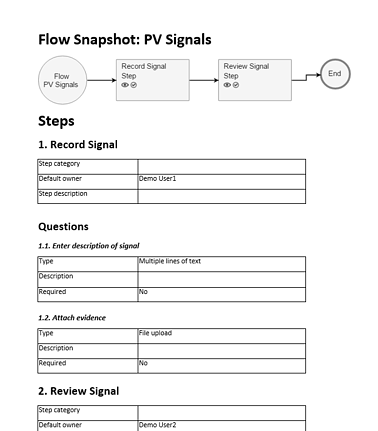 The snapshot lists out every process step, question and business rule in the Flow. This feature is aimed at compliance requirements where auditors require a human readable description of the Flow at a set point in time. This is a requirement for 21 CFR Part 11 compliance, but is useful across many industries. The integrated form audit feature captures all actions that happen on a form throughout the process and also stores the audit record within the form. An audit viewer provides a human readable view of the audit record. Enables users to construct an environment that can be independently audited against regulatory requirements. Processes can be designed so that process steps are signed, historical form activity is clearly visible, and a snapshot of the workflow is captured at a specific point in time. All records can be easily and quickly understood by external auditors, who may not have any prior knowledge of processes in use.